Special counsel Robert Mueller walks with his wife, Ann, in Washington, D.C., on Sunday. The Justice Department is expected to send a summary of his findings to Congress. That was despite "multiple offers from Russian-affiliated individuals to assist the Trump campaign," he wrote. However, Mueller's investigation did not take a position on whether Trump obstructed justice by trying to frustrate the ongoing investigation. "[W]hile this report does not conclude that the President committed a crime, it also does not exonerate him," Barr quotes from Mueller's report. The attorney general wrote that he and Deputy Attorney General Rod Rosenstein had concluded that the findings of the special counsel were "not sufficient to establish that the president committed an obstruction-of-justice offense." The Justice Department leaders reached that conclusion, Barr wrote, without regard to the "constitutional considerations" that surround whether the department can seek an indictment of a sitting president. Trump talked with reporters as he prepared to return from Florida to the White House, calling the investigation "an illegal take-down that failed." "It was just announced there was no collusion with Russia, the most ridiculous thing I've ever heard. There was no obstruction, and it was a complete and total exoneration," Trump said before boarding Air Force One. "It's a shame our country had to go through this, and to be honest, it's a shame your president had to go through this." Trump also said: "Hopefully someone's going to look at the other side," seeming to revive suggestions that he wanted an investigation into his 2016 Democratic opponent Hillary Clinton, which he has called for several times. At Trump's rallies, there are frequent chants of "Lock her up!" FBI Director James Comey announced in 2016 that Clinton would not be charged. Trump's outside attorneys, including Rudy Giuliani and Jay Sekulow, released a statement on Sunday hailing what they said was "a complete and total vindication of the president." Top Republicans also seized on the news, arguing that Trump has now been absolved. Senate Judiciary Committee Chairman Lindsey Graham, R-S.C., who played golf on Sunday afternoon in Florida with the president, said in a statement: "Good day for the rule of law. Great day for President Trump and his team." "The cloud hanging over President Trump has been removed by this report," Graham added. "Bad day for those hoping the Mueller investigation would take President Trump down." 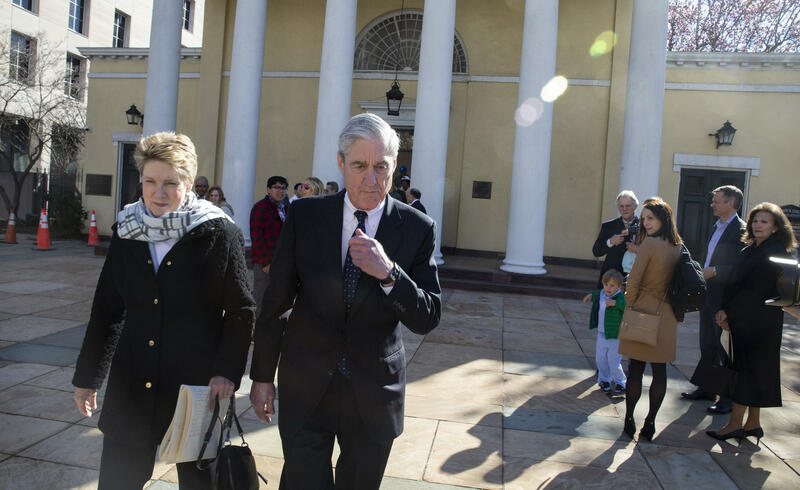 House Minority Leader Kevin McCarthy, R-Calif. said: "It is abundantly clear, without a shadow of a doubt, there was no collusion ... This case is closed." Georgia Rep. Doug Collins, the top Republican on the House Judiciary Committee, said Barr's letter should "assure every American there was no collusion between Russia and Donald Trump or his campaign." "The special counsel's investigation was long, thorough and conclusive: There was no collusion. There is no constitutional crisis," Collins added. "As the report states, 'the evidence does not establish that the president was involved in an underlying crime related to Russian election interference.' "
Collins also urged House Judiciary Committee Chairman Jerry Nadler, D-N.Y., to "rethink" the committee's ongoing investigations and shift to focus on issues such as immigration and criminal justice reform. Nadler, however, was more cautious and seized on the language by Barr that suggests Mueller's report left in limbo the question of whether Trump obstructed justice. "Mueller clearly and explicitly is not exonerating the President, and we must hear from AG Barr about his decision making and see all the underlying evidence for the American people to know all the facts," Nadler tweeted. He continued: "There must be full transparency in what Special Counsel Mueller uncovered to not exonerate the President from wrongdoing. DOJ owes the public more than just a brief synopsis and decision not to go any further in their work." Nadler also argued that given the 22 months Mueller spent investigating Trump, the two days that Barr spent boiling down his work is not sufficient. The House Judiciary Committee chairman said he intends to call Barr to testify soon before a hearing. House Speaker Nancy Pelosi and Senate Minority Leader Chuck Schumer waited more than two hours after the letter's release to issue a statement, writing that it "raises as many questions as it answers" and continuing to call for the report's full release. The Democratic leaders echoed Nadler in pointing out that Barr's letter notes that Mueller did not exonerate Trump on the question of obstruction. They wrote it "demonstrates how urgent it is that the full report and underlying documentation be made public without any further delay. Given Mr. Barr's public record of bias against the Special Counsel's inquiry, he is not a neutral observer and is not in a position to make objective determinations about the report." Barr wrote that Mueller interviewed about 500 witnesses, made requests to 13 foreign governments for evidence and obtained more than 230 orders for communications records. He also said that Mueller hasn't recommended indictments against anyone else and that there are no sealed indictments that have yet to be made public. The news about no more charges was part of the announcement on Friday when Mueller notified the leaders of the Justice Department that he had completed his work, which began in May 2017. For much of the weekend, Washington has been anticipating the conclusions from Barr, who spent Saturday and Sunday in his office, along with Rosenstein. According to a senior Justice Department official, Barr's chief of staff called White House lawyer Emmet Flood at 3 p.m. to give him a "readout" of the letter. Mueller has not been at the Justice Department this weekend, and he "was not consulted on this letter," according to the department. The Justice Department is not giving a timeline as to when it may release additional material from the Mueller investigation, and it will review the report and materials for grand jury information and for information that could implicate ongoing investigations. Calls have been nearly universal and bipartisan for Mueller's original report to be released and for the public or Congress to access its findings and its underlying source material. Many Republicans and Democrats agree that they will not be content only with a Barr-drafted synopsis of the report. "It needs to be released to the Congress, and it needs to be released to the American people," Sen. Ted Cruz, R-Texas, told CNN on Sunday morning. "This has consumed two years of the American people's time, and we need full transparency." Congressional Democrats appeared nearly unanimous about the need for wide release, and individual Democratic leaders also tried to pre-empt what they feared might be attempts by the White House to conceal Mueller's findings. Specifically, one long-standing question has been whether Trump might seek to invoke executive privilege, the doctrine that allows an administration to keep secret some of its internal workings. Nadler, the House Judiciary Committee chairman, told NBC on Sunday morning that he thinks the president shouldn't attempt it. "I do not believe it exists here at all because, as we learned from the [Richard] Nixon tapes case, executive privilege cannot be used to hide wrongdoing," Nadler said. Continued Nadler: "In that case, the Supreme Court, nine to nothing, ordered that all the claims of executive privilege be overridden and the tapes be public. ... The president may try to assert it, may try to hide things behind it. But I don't think that's right or [will] be successful." Trump, for his part, has said in the past both that he doesn't mind if Mueller's report becomes public — because he says he has done nothing wrong — and that there shouldn't have been a Mueller report in the first place. Trump has gone back and forth about what he accepts about Russian interference in 2016, but he has been consistent that neither he nor anyone in his campaign had any connection to it. That idea is a "hoax" perpetuated by conspirators and Democrats who are sore that Clinton lost to him, Trump says, and who have been consequently running a "witch hunt" against him. NPR reporters Susan Davis, Tamara Keith, Ayesha Rascoe and Kelsey Snell contributed to this report. An earlier version of this story incorrectly referred to Kevin McCarthy as the House majority leader. He is the House minority leader.